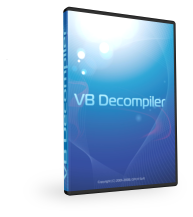 VB Decompiler in a business, academic, or government environment. (physical or virtual PCs) within the same company. More information about tracing features you can read here. Additional one year of updates and support. Only for registered customers. With Personal License, you can use VB Decompiler only for non-commercial purposes in non-business, non commercial environment. You can't use this license to decompile commercial code and use recovered code in a business. That is, you only intend to use it at home for private use. You can use the program on one physical computer or virtual pc. Your unlock code and license will be assigned to a private person. 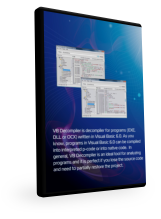 With Business License, you (individual or company) can use VB Decompiler in a business, academic, or government environment. You can use the program on exactly one physical computer or virtual pc per license. There are no floating (concurrent) licenses. If more than one person works with the program, you need to purchase additional licenses for each party. The license and unlock code will be assigned to the name provided at the time of purchase and will reflect the total number of licenses purchased. Your license will remain valid for a period of 12 months. After this period it will remain functional, but you will not have the access to a new versions, upgrades and technical support. Licenses are non-transferable. A person or a company registered as a license user is assumed to be the owner of the license. Once issued, the license may not be transferred to another user or re-registered to another username. A company can allocate and deallocate business licenses to employees as needed. We accept Visa, MasterCard/Eurocard, American Express and Diners Club. When you pay by credit card, your order will be processed immediately. Postal mail shipments are initiated immediately. Products available electronically are generally ready for downloading immediately, or no more than 48 hours after you place your order. To avoid fees on international bank transfers, we offer the option of transferring the order amount to an account in Germany, France, or the United Kingdom. You will receive the bank account information by e–mail after your order is submitted. Your order will be shipped as soon as payment is received. We accept debit cards from Switch and Solo (UK). When you pay by debit card, your order will be processed immediately. Postal mail shipments are initiated immediately. Products available electronically are generally ready for downloading immediately, or no more than 48 hours after you place your order. We accept personal checks from our US customers. We also accept Canadian personal checks that are written on US Dollar accounts. We request that customers outside of the USA and Canada send only guaranted bank checks such as cashier checks. You will receive detailed information by e–mail after your order is processed. Products will be shipped at once as payment has been received. You can also send us cash by mail. You will receive notification of our postal address by e–mail after your order is submitted. Your order will be shipped as soon as payment is received. We also accept Purchase Orders. Your license will be shipped after we received your payment. We accept PayPal payments in USD, EUR, CAD, GBP, and JPY. If you choose PayPal as your payment type, you will be automatically redirected to PayPal's website. Log on as usual, or set up an account and enter all required information to pay for your order. We accept WebMoney payments in US dollars (USD) and euros (EUR). You will need a valid account with WebMoney to pay on our sites using this payment type. All payments are secure (SSL/VeriSign) and may be in Euro, US/Australian/Canadian Dollars, Pound Sterling and Yen currencies. You will receive full version of Product in nearest 48 hour after your order will be processed. As registered user you will receive all updates are absolutely free during free updates period depends on your license.